The orange coloured pot and cups came as a set, which I bought in Ying-ge, Taiwan. This is a very famous area in Taiwan for producing ceramics. All of this for the price of $26. Ca. in 2005. This was my initial baozhong/oolong pot which has now been designated to varying oolongs. 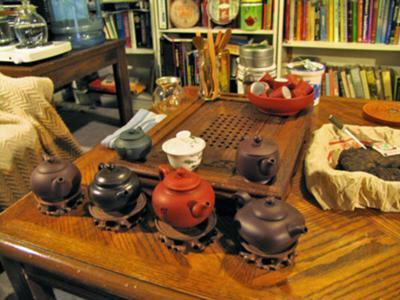 The brown clay teapots on stands, at the front and rear are XingYi pots and were bought online for $12. and $20. They are used for raw and ripe pu-erh teas. The brown pot on the front of my cha-pan (tea tray) is a XingYi pot purchased in Shanghai for about $30. Ca. This is my TGY pot. It came with a photo of the artist/potter holding the pot. The darkest coloured clay teapot on a stand is my Baozhong pot. It is another hand-made, XingYi pot that I purchased in Zhuhai for a little less than $30. Ca. The walls on this pot are so thin that it rings like a bell when tapped with the lid. The cha-pan (tea-tray) was purchased in the same tea-shop for $35. The small green pot is also from Ying-Ge, in Taiwan. It was a gift from a friend who also gave me the utensils. I use it for TGY also. The gawain is from a travelling set that I bought online for $12. Ca. The set include: the gawain, a serving boat, six small cups, a small set of thongs and a travelling bag. The glass tea-boat was purchased in Vancouver for $8. The stands were also purchased in Vancouver for $4.50 each.